The Ford Edge Concept offers a remote parking assist feature. At the 2013 Los Angeles Auto Show, the Ford Motor Company revealed its Ford Edge Concept, a crossover utility vehicle that demonstrates the design direction for this popular model line. It also showcases technology not yet available elsewhere: a fully assisted parking aid that can self park the vehicle when operated by the driver when sitting inside or standing outside by remote control. With the Ford Edge Concept, the automaker is making available tomorrow’s technology today. 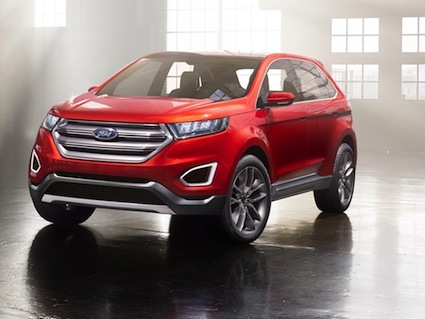 As a concept vehicle that does not mean the Ford Edge will immediately gain this and other featured leading edge technologies, but it does underscore that the technology is in progress and may soon become available. The Ford Edge is a midsize crossover utility vehicle that seats five. Introduced in 2007, the Edge was updated in 2011. It offer standard front-wheel drive and available all-wheel drive and is powered by a family of four and six cylinder engines. These engines are paired with a six-speed automatic transmission. Ford describes its prototype technology as a “fully assisted parking aid” that allows drivers to select a button inside the cabin to self park the vehicle. Utilizing ultrasonic sensors the Ford Edge Concept can find an empty perpendicular parking spot to occupy. If the driver is outside of the vehicle, a key fob button can be activated to enable the crossover to pull out of a parking space. This feature may be ideal for times when parking room is tight. By simply activating the button, the Ford Edge backs out of its space, stops and the driver and passengers can enter, buckle up and drive off. Ford’s remote control parking builds on a foundation that has produced many other safety features in recent years including technologies used in most Ford and Lincoln models. Ford’s Blind Spot Information system makes use of radar sensors located in the rear corners of the vehicle that measure the space between vehicles next to or just behind the car. When a vehicle enters the driver’s blind spot, a warning light flashes on the mirror. Adaptive cruise control along with collision warning with brake support ensures that your car remains a safe distance behind the vehicle you are following. If the vehicle in front slows down, the cruise control adapts to the new speed. And if that vehicle suddenly stops, your adaptive cruise control enabled vehicle will automatically brake and stop too. Ford employs radar to detect the movement of vehicles in front of your Ford or Lincoln. Ford also offers lane keeping assist on many of its models. This technology makes use of a forward-facing camera that scan the road surface for lane markings. If your vehicle begins to drift out of its lane, a vibrating alert is sent to the steering wheel. If you do not respond to the alert, your vehicle is gently nudged back to its lane. Ford’s remote control parking builds on its active park assist technology currently available on a dozen Ford vehicles today. When drivers are ready to parallel park their vehicle, the driver releases the steering wheel while maintaining control over the brake and accelerator. Using sensors and the vehicle’s steering system, the car is self-parked without incident. Besides its technological enhancements, the Ford Edge Concept showcases a number of interior updates including an LED-lit “Edge” scuff plate in bright silver finish, a unique gear shifter, a leather-wrapped steering wheel, a hand-stitched leather instrument panel, a 10-inch display screen with MyFord Touch, and a unique steering wheel. The concept also is outfitted with a dynamic center stack with premium mechanical switchgear and a floating binnacle top. Three exterior features are displayed as well and include enhanced active grille shutters, air curtains, and automatic start-stop technology. Combined, the three are designed to enhance fuel economy for the Ford Edge. Timothy Henson is a professional blogger that provides information on CDL truck driving jobs and trucking companies. 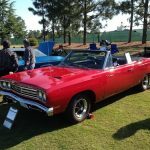 He writes for BestDriverJobs.com, the best source for finding truck driving jobs and owner operator truck driving jobs.